The Digital Sound Board - ProE is a full featured mono digital sound board with many unique features and applications. Up to 4 - minutes recording time for 1 - mono channel or multiple mono channels (1-6). Sounds can be recorded to from any sound source, including a computer connection with audio output. On-board 7 - watt mono amplifier with volume preset control for external 8 ohm speaker monitor. Line output jack for connection to large remote amplifier and speaker. Line input recording jack, for easy connection to sound input source. Playback (channels 1-6) under manual control, sensor, relay, automated controller board activation or direct computer control (all channels 1-6). Optional Sequence, Random or immediate On / Off playback board features available. The supplied 4 - minute ISD sound chip has a great frequency response up to 3.4 KHz. and a audio sample rate of 8.0 KHz. Audio can be re-recorded up to 100,000 times and can be stored up to 100 years. Board is excellent for many Animatronic, Robotic and Haunted Industry applications where quality audio is required on a single easy to use device. Board is very easy to set-up, record to and use through on-board jumpers, audio in / out jacks and status operation LED's. Sound IC chip can be removed, for upgrade or saving of sound files. Total message lengths up to 4 minutes. Power supply, speaker, switches, amp, sound source, audio cables not included. .Sound Board with Instant On and Off Sound playback. Record / Playback Module - 8 Channels Hardware Description. Sound Board VEGAS-8E with Instant On and Off, Manual Sound Playback options. Speakers / audio amplifier, audio cables, power supply, sound playback system, switching input device not included. The 4-Channel Audio Mixer Pro Active audio mixer allows you to take the audio ouput of up to four different audio output devices and mix them into one audio output channel. Take four audio inputs "Actively" mix them into one direct output audio channel, playing all four simultaneous audio outputs as one. On-board mix potentiometers with knobs allows for complete volume customization for each input audio channel. The 4-Channel Audio Basic Mixer passive audio mixer allows you to take the audio ouput of up to four different devices and automatically merge them into one audio output. Speakers / audio amplifier, audio cables, sound playback system, switching input device not included. Board will take a stereo sound input and distribute it to any of 4 output channels. The output channel that the sound will come out of is programmed by the user. Multiple Channels can be selected together. A program can last up to 15 minutes. There is a Loop Switch that will cause the program to repeat after a delay that is set by an on-board potentiometer. The board can be triggered by pressing the Play Button, a dry contact closure at the Remote Trigger Terminal or by an optional PIR sensor (not provided). Also, the board can run in Random Mode where the outputs are randomly selected (one at a time) and will stay selected for an amount of time entered by the Delay Pot. When playback is initiated, a 50 mS dry contact closure will occur at the Synch Out Terminal. This can be used to trigger another device (like a sound board) to start simultaneously. Speakers / audio amplifier, audio cables, sound playback system, power supply not included. Board will take a stereo sound input and distribute it to any of 8 output channels. The output channel that the sound will come out of is programmed by the user. Multiple Channels can be selected together. A program can last up to 15 minutes. There is a Loop Switch that will cause the program to repeat after a delay that is set by an on-board potentiometer. The board can be triggered by pressing the Play Button, a dry contact closure at the Remote Trigger Terminal or by an optional PIR sensor (not provided). Also, the board can run in Random Mode where the outputs are randomly selected (one at a time) and will stay selected for an amount of time entered by the Delay Pot. When playback is initiated, a 50 mS dry contact closure will occur at the Synch Out Terminal. This can be used to trigger another device (like a sound board) to start simultaneously. This board will allow the user to select between 2 stereo sound inputs and 2 stereo outputs and switch them in various configurations. Power (9 VDC - 0.5Amp ) is applied to the board via a 2.1mm barrel connector or 2-position terminal block. Indicator LEDs will show which inputs and outputs are active. Relays or Switches can be used to switch between the different inputs and output configurations, or optional wireless control and remote wired switch board. Switching can be done manually or setup by optional RF wireless switch control to various various In-Out audio channels as needed. 1/8" miniplug audio in/out audio jacks. Application: Control Board can connect a Microphone and Amp , MP3 player, AutoTalk Board and Audio - Amp / Speaker together and allow user to talk through AutoTalk Board or have MP3 playback through AutoTalk, while also going to a Amp / Speaker system output. This unique board is designed to allow you to distribute a stereo sound from a single input to one of 8 outputs in sequence, random or sequence automatic when a trigger event (dry contact closure or tactile switch press) is activated. There is a switch input that will tell the board to sequentially step through the outputs or select one channel at random each time a trigger switch event occurs. In automatic sequence, each channel automatically 1-8 is sequenced and repeated, as long as the trigger input is held active. Automatic sequence between channels is currently set at 3 seconds, but can be eadily modified to any time delay by BPE when ordering board. A yellow LED will be illuminated as long as the trigger event is present. Green LEDs will indicate which output is enabled, Red Power light. This board will allow the user to select between 2 microphone inputs and one audio input to be routed to a stereo output jack. DC Motor Driver- "Talking Fish"
Board accepts audio input from any non-amplified sound source (computer, CD player, or Digital Sound Board) and activates a Solid State Relay ON and OFF in sync with the incoming audio signal. The on-board 1 Amp Solid State Relay can be connected to any device using (3-60 Vdc @ 1 Amp power). Common application include driving a pneumatic solenoid valve, water valve to sound or operating large bank of LED's -DC lighting to the incoming sound. There is an on-board potentiometer that is used to adjust the sensitivity to the incoming sound. The board has a 1/8" phono jacks for input that can be switched as a left or right audio input signal for more precision audio sync to incoming sound signal track. An on board LED indicates when the 1 Amp Solid State Relay is activated. Relay has wire terminal block contacts for connecting directly to device / load and quick connect power jack or wire terminal block for device power input. Board can operate devices requiring 3-60 VDC at 1 Amp load. Heavy Duty Version Sound Activated SS Driver Board 9 -12 VDC operation. Feature packed, proven quality and reliability, the Pro Sound Card is a digital audio repeater that can be used for interactive displays, standalone music, message announcement, concert audio, home theater audio, Animatronic shows or anywhere quality audio is needed for your application. The Pro Sound Card is simple to operate and setup, you simply record the WAV files on your PC, and name the WAV files how you want them to play. You next copy the WAV files to a Compact Flash card, connect speaker(s), and plug in the Pro Sound Card using the included wall transformer. Audio is played out via the built in High Power Stereo amplifier, or you can connect it to your own amplifier using the line-level out jacks. Eight contact sense input are built in for triggering sounds with switches or motion sensors along with 8 relay outputs for controlling attached devices. If using the built in optional BASIC command control language, the relays can be controlled individually, and inputs can be used to control program flow and operation. The Pro Sound Card's 44kHz 16 Bit stereo CD/DVD quality audio and built in digital stereo amplifier will astound you. Connect a set of quality speakers and you will not believe the fidelity and power of what you hear. The built in Class D amplifier generates unbelievable audio power with no heat! It's digital right to the speakers! You can record your audio files using the sound recorder software included with your computer, our use one of the many audio editing software packages that are free on the internet. Using an audio editing software allows you to add effects, fades, noise, tones, touch tones, silence, background music and more, that will make your audio WAV files sound like they were done by a pro. Volume may be remotely adjusted by connecting momentary push button switches to the provided pin header connector located on the main PCB , or the on-board buttons can be used to control sound levels of the Pro Sound Card. Wall transformer included for operation on 120 or 240 VAC 50/60Hz. * Stereo and Mono .WAV files supported. 44KHz 16-Bit sample rate. * Built-in High-Power Digital Class D Stereo Amplifier for 4 or 8 ohm speakers. * Built-in 35mW stereo headphone amplifier.16 - 64 ohm headphone support. 1/8" Stereo jack for headphone connection. * Line level output via 1/8" stereo jack for connection to external amplifier or PA system. * Line level input via 1/8" stereo jack for audio pass through when audio file is not playing. * Diagnostic LED's to insure proper operation, configuration, and card status. * Low power, 100mA idle, less than 250mA playing sounds at moderate volume levels. * Small size of only 6.1" x 4.2" x 1.75". * Sound wav files, control files are loaded directly onto FLASH Card, and card is inserted into Controller for playback. * Terminal connectors for switches / sensors, power. 2- Gig FLASH Card, Wall power supply, Two Speakers, 8 remote wired switches and hookup wire included. Eight 1.4" Diameter Black push buttons wired on 10' of 22 gauge 12 conductor wire. Each switch is labeled 1 - 8. Switches are grouped in to four groups of two switches. Each group has 16" of wire to them, so each group can be mounted 30"-32" from the furthest group. The electrical part of the switch easily snaps off the bottom of the of the mounted portion of the switch, so that it can be installed without removing the wiring. The other end of the 22 gauge 12 conductor cable has a 10 Pin connector on it for plugging into an IO expansion module on the Sound Board Controller. 1/8" miniplug audio input jack. NOTE: AutoTalk requires Line Level Input of 1Vpp Input source. Many MP3, iPod playback modules will require an audio amp to work with the AutoTalk board, since the line level from these devices are too low. Using the handheld RF Transmitter, any of 1-8 channels of MP3 Audio can be selected for playback form the 8 Channel MP3 playback board. There are 3 modes of operation provided ­ Sequential, Random (10 Channels Available) and Individual Channels 1-8 selection for playback. An MP3 Stereo Audio Controller, that when triggered by RF remote switch input board will cause the player to play back 1 to 8 MP3 files that are stored on a USB flash device (USB flash drive not included). These MP3 files can be of any size up to the capacity of the USB flash device. You can have any number of files up to 8 on the flash device. Board operates from 9 VDC @ 0.5 Amp Power Supply. 1/8" miniplug audio output jack. The Wizard - 8 board provides a single channel, user programmable 5 - minute digital output (relay) combined with a digital 4 - minute duration user record IC sound chip. The supplied 4 - minute ISD sound chip has great frequency response up to 3.4 KHz and a audio sample rate of 8.0 KHz. Audio can be re-recorded up to 100,000 times and can be stored up to 100 years. One - Digital channel - either 0/4.5V @ 50mA output or on-board relay rated 30V @ 2A with wire terminal strip. One - 4 minute quality digital IC sound chip. Digital recording to Sound IC chip is through a direct line input (Computer sound card or output port, CD player or any sound source output). Potentiometer to adjust the time delay between loops in playback of recorded sound and relay action ON and Off. Digital ON - OFF and GO programming buttons, AUTO - PLAY, PLAY - RECORD and SOUND - RELAY switches. No computer is needed for programming. REMote start option - for interfacing to sensors, switches, remote relays, pressure pads, PIR sensors, etc. Board operates from regulated 9 VDC @ 0.5 Amp power supply. The Wizard - 5 Board will record and playback up to 5 minutes of action for up to 2 servos and 2 digital outputs. It also incorporates a 4-minute audio recording and playback sound chip with the ability to control one servo channel either from recorded moves or from an audio signal, direct or from on-board sound chip. The card includes features such as looping action with variable delay between loops, auto start-up on power up and a connection interface for a PIR, remote switch or pressure pad to initiate playback. Recording sessions are built up on a track-by-track basis- no programming is required. During recording, all previously recorded tracks are re-played to aid synchronization. 2- Digital channels- either 0/5V @ 10mA outputs or relay rated 30V @ 2A . 2- Servo channels ­ one channel may be automatically controlled from an audio signal either from the line input or from the on-board sound chip. 4 - minutes high quality sound chip- digital recording selected from either from the line input (ie from a sound card and wav files) or from the on-board electret microphone. Potentiometer to adjust the servo position and the time delay between loops in loop-play. Digital ON-OFF, NEXT, PLAY and RECORD buttons. Record enable/disable jumper, EEprom protect jumper. Sync output for multi-board operation. Remote start option- for switches, sensors / PIRs, etc. Maximum and minimum set points to the audio servo channel, and many more features. The Wizard - 11 Board will record and playback up to 6 minutes of action for up to 6 servos and 2 digital outputs (on-board relays). It also incorporates a 4-minute audio recording and playback sound chip with the ability to control one servo channel (AutoTalk) either from recorded moves or from an audio signal, direct or from on-board sound chip. Recording sessions are built up on a track-by-track basis- no complex programming is required and no computer is needed. During recording, all previously recorded tracks are re-played to aid synchronization. 2- Digital channels- either 0/4V @ 10mA outputs or relay rated 30V @ 2A . 6- Servo channels ­ one channel may be automatically controlled from an audio signal either from the line input or from the on-board sound chip. 4 minute, high quality sound chip- digital recording selected from either from the line input (ie from a sound card and wav files) or from microphone input. NOTE: The Wizard -11 requires twin power supplies. Pin-set 1 (on the extreme left) relates to sound track 1- if you want sound track 1 to play-back through outputs 2, 6 and 8 you would put a jumper over pins 2, 6 and 8 on pin-set 1. If you want to play sound -track 2 through outputs 1,3 and 5 then you would put jumpers over pins 1, 3 and 5 on pin-set 2 etc. Programmable board will switch 8 different digital audio recorded signals to 1-8 different output channels. 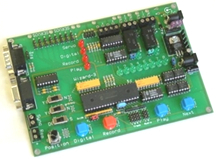 User can program board to switch audio signal to any of 1-8 output channels. Any combination of audio out channels can be activated on and off. Controller is easy to program and setup. Board comes with 4 minute Audio chip on board, but can be switched to 8 or 12 minute chip upgrade option. There is 1 audio jack input for recording 8 different sounds into the Digital sound chip directly by an audio source and 8 on board line output channels jacks to remote amps and speakers setups. You can adjust the play-back output select jumpers at any time- they are read just before starting any new play-back. When the audio is combined with any of the Wizard Relay boards, the system becomes an automated audio sound effects and switcher system. Custom interface board allows you to add the VMusic2 MP3 Player to your DMX project or display. Requires either 3 or 4 DMX channels and the control protocol allows easy use with a standard DMX (slider) desk. Select to control the volume either with the left and right channels ganged (3 DMX channel operation) or separately (4 DMX channel operation). NOTE: USB Drive Must Be Formatted first use. "SanDisk" Media USB drive, formatted at FAT, FAT16 first time use. MP3 files must be labeled - "001.mp3 to 032.mp3"
Here is an audio controller that when triggered by pressing the single on-board button or by dry contact closure at the trigger terminal, will cause the player to play back 1 to 63 MP3 quality files that are stored on a small SD Card. These MP3 files can be of any size up to the capacity of the SD memory card, You can have any number of files from 1 to 63 on the SD card. Board operates from 9 Vdc @ 0.5 Amp regulated VDC Power Supply. 1/8" miniplug audio output jack. In Sequential Mode, the player will play the files back sequentially from file001.mp3 to file063.mp3 (or whatever your last file is), one file at a time each time the board is triggered. After it has played the last file, it will go back to file001.mp3 and start over. This MP3 controller can be used in a prop, with an animatronic character, puppets, information display exhibit, at museums, zoos, as public information boards and other areas to play very high quality stereo audio sound every time it is activated. This very unique audio controller has two 63 channel MP3 playback controlled players on a single board. Each MP3 player can be independently triggered by pressing the single on-board button or by dry contact closure at the trigger terminal for each MP3 module and will cause each player to play back 1 to 63 MP3 quality files that are stored on a small SD Cards. These MP3 files can be of any size up to the capacity of the SD memory cards, You can have any number of files from 1 to 63 on each SD cards. Board operates from 9 Vdc @ 0.5 Amp regulated VDC Power Supply. 1/8" miniplug audio output jacks. Each MP3 module can be set independently to Sequence or Random or Mixed mode , one player module random and the other player module sequenced when triggered. This unique MP3 player can be used to play background audio, while foreground audio is also played simultaneously. If you have two characters, each channel can provide audio for that character. Switching back and forth between individual triggers or simultaneously triggering the audio can provide character dialog that are interactive. Use this board for sound effects, and also dialog, at the same time. Can be used in a prop, with an animatronic character, puppets, information display exhibit, at museums, zoos, as public information boards and other areas to play very high quality stereo audio sound every time it is activated. Two (2) channels of independent sound together, independently. each has it's own control trigger. This is an audio controller that has an on board timer that can be set for 9 various times to automatically play back 1 to 199 MP3 files that are stored on a small SD Card or triggerd traditional by external switch or dry contact closure, relay boards. These MP3 files can be of any size up to the capacity of the SD memory card, You can have any number of files from 1 to 199 on the SD card. In Sequential Mode, the player will play the files back sequentially from file001.mp3 to file063.mp3 (or whatever your last file is), one file at a time each time the board is automatically triggered. After it has played the last file, it will go back to file001.mp3 and start over. In Random Mode, the controller will pick one of the files to play back at random. It will pick a new random file each time the board is automatically triggered. This MP3 controller can be used in a prop, animatronics, puppets, information display exhibits, museums, zoos, as public information boards and other areas, anywhere where you might need an audio file to be played back based on an automated time trigger. This is an audio controller that has an on board external trigger input or can be activated by on board timer that can be set for 9 various times to automatically play back 1 to 199 MP3 files that are stored on a small SD Card and also activate two (2) Solid State relays for 200 mSec ON closure/pulse when triggered. These MP3 files can be of any size up to the capacity of the SD memory card, You can have any number of files from 1 to 199 on the SD card. The board can also be set to external / remote trigger, There are two modes of audio file playback that are provided on board when the board is activated, Sequential or Random playback. In Sequential Mode, the controller will play the files back sequentially from file001.mp3 to file063.mp3 (or whatever your last file is), one file at a time each time the board is automatically triggered. After it has played the last file, it will go back to file001.mp3 and start over. This unique MP3 audio controller has the ability to immediately stop and re-start a single channel audio play back by manual control from a remote connected momentary switch. The MP3 file can be of any size up to the capacity of the SD memory card. This MP3 controller can be used in a prop, or working railroad model, (Train Whistle) anywhere a sound is need to be immediately stopped and re- started manually at any time by a remote connected switch. An MP3 Stereo Audio Controller, that when triggered by optional remote relays or manual switches connected to the remote switch input board will cause the player to play back 1 to 10 MP3 files that are stored on a USB flash device (USB flash drive not included). These MP3 files can be of any size up to the capacity of the USB flash device. You can have any number of files up to 10 on the flash device. Board operates from 9 VDC @ 0.5 Amp Power Supply. Manual mode: any channel 1 - 10 can be played back by selecting one of the remote manual switches corresponding to the sound channel. The board will wait until the file has finished playing before it can be activated again. Sequential Mode: the player will play the files back sequentially from file000.mp3 to file009.mp3 (or whatever your last file is), one file at a time each time the board is triggered. After the board has played the last file, it will go back to file000.mp3 and start over. Random Mode: the control board will pick one of the files to play back at random. The board microprocessor will pick a new file each time the board is triggered. The board will wait until the file has finished playing before it can be activated again. Manual mode: any channel 1 - 10 can be played back by selecting the remote switch corresponding to the sound channel, along with the corresponding activation of the channel 1-10 for any optional remote boards. The board will wait until the file has finished playing before it can be activated again. Sequential Mode: the player will play the files back sequentially from file000.mp3 to file009.mp3 (or whatever your last file is), one file at a time each time the board is triggered, along with activating any optional remote boards connected for that channel. The remote boards will stay activated for as long as the sound file is playing. After the board has played the last file, it will go back to file000.mp3 and start over. Random Mode: the control board will pick one of the files to play back at random, along with activating any optional remote boards connected for that channel. The remote boards (Ch1-10) will stay activated for as long as the sound file is playing. It will pick a new file each time the board is triggered. The board will wait until the file has finished playing before it can be activated again. This MP3 controller can be used in a prop, animatronic character, puppets, information display exhibit to play very high quality stereo audio sound every time it is activated and activate remote lighting, effects, animatronic controllers or other devices connected to the remote function boards. Several board configuration setup options are available. NOTE: channels for each group of audio, video, relays all sync together as a single channel. In Sequential Mode, the player will play the files back sequentially from file000.mp3 to file254.mp3 (or whatever your last file is), one file at a time each time the board is triggered. After it has played the last file, it will go back to file000.mp3 and start over. Player can restart playback from last file played before power was turned off, or you can restart back at audio file 1. Very unique controller that uses VMusic2 MP3 Player and microprocessor controller to playback 512 audio files, with on-board PIR Sensor and Relay design. The controller, when triggered by pressing the on-board Play button or by dry contact closure at the trigger terminal, will cause the player to play back one of up to 512 MP3 files that are stored on a USB flash device (i.e., USB pen drive - not included). These MP3 files can be of any size up to the capacity of the USB flash device. You can have any number of files up to 512 total files on the flash device. An on board 5Amp relay that will activate and stay on while the current audio file is playing. is available. There is an optional PIR sensor connector and control circuit also built on board if you want playback automated with sense and play features. There are 2 modes of operation provided ­ Sequential and Random. The mode is set using the small slide switch located near the connector for the player module or by providing a dry contact closure at the Remote R/S Selection Terminal Block. When the contact is closed, the board will be in Random mode. In Sequential Mode, the player will play the files back sequentially from file000.mp3 to file511.mp3 (or whatever your last file is), one file at a time each time the board is triggered. After it has played the last file, it will go back to file000.mp3 and start over. If the board is powered off, it will remember that last file played and when powered on again, will play the next file. In Random Mode, it will pick one of the files to play back at random. It will pick a new file each time the board is triggered. The audio from the VMUSIC2 module is routed to a stereo audio jack on the board. When a file is playing, audio will be available there as well as from the front of the module. Audio from these outputs will need to be amplified and sent to optional speakers. Board has a terminal block for a remote power switch. This unique board uses a VMusic2 MP3 module Player and several PIC microprocessors to playback MP3 Audio, control an R/C servo with sound motion (AutoTalk), activate a 5 Amp mechanical Relay through on-board manually, remote trigger or by PIR Sensor. The controller, when triggered by pressing the on-board Play button, by dry contact closure at the trigger terminal or optional PIR sensor will cause the player to play back one of up to 512 MP3 files that are stored on a USB flash device and use the volume of the sound played to control the movement of a R/C servo. The MP3 files can be of any size up to the capacity of the USB flash device. You can have any number of files up to 512 total files on the flash device. There are 2 modes of file playback provided ­ Sequential and Random. The mode is set using the small slide switch located near the connector for the player module or by providing a dry contact closure at the Remote R/S Selection Terminal Block. When the contact is closed, the board will be in Random mode. In Sequential Mode, the player will play the files back sequentially from file001.mp3 to file512.mp3 (or whatever your last file is), one file at a time each time the board is triggered. There is a Playback Delay Potentiometer that will allow you to prevent the board from being re-triggered for up to 5 minutes after the audio file has played. If the potentiometer is set to zero, the board can be retriggered immediately after the previous file has ended. If the pot is set at greater than zero, a yellow status LED will flash once/second during the wait period. After it has played the last file, it will go back to file001.mp3 and start over. If the board is powered off, it will remember that last file played and when powered on again, will play the next file. In Random Mode, it will pick one of the files to play back at random. It will pick a new file each time the board is triggered. A 5 Amp relay will activate and stay on while the current audio file is playing. The audio from the VMUSIC2 module is routed to a stereo audio jack on the board. When a file is playing, audio will be available there as well as from the front of the MP3 module. Audio from these outputs can be sent to an optional audio amplifier and out to speakers. Wizard - 3 Board is pre-assembled and tested. cards together. The card may be connected to the optional Sound Board Pro to provide audio accompaniment to the tracks. Recording tracks are built up in real time on a channel-by-channel basis no programming is required. During recording all previously recorded channels are re-played to aid synchronization. NOTE: Sound Board Pro required if sound option is used. Regulated Power Supplies ( 5-6 and 9 VDC ) and Servos, not included. Board accepts audio input from any non-amplified sound source (computer, CD player, or Digital Sound Board) and when the volume reaches a certain level, it activates an on board 10 Amp relay. The relay can be used to switch another device on and off in sync with the volume of the input. There is an on-board potentiometer that is used to adjust the sensitivity to the incoming sound. The board has a 1/8" phono jacks for input that can be switched as a left or right audio input signal. An on board LED indicates when the 10 Amp relay is activated. Relay has NO, Com, NC wire terminal block contacts (form C relay). Board operates from 12 VDC power supply. Board accepts audio input from any non-amplified sound source (computer, CD player, or Digital Sound Board) and when the volume reaches a certain level, it activates the on-board delay timer relay circuit on. The relay can be set to switch off after a delay time period. Sound Input: There is an on-board potentiometer that is used to adjust the sensitivity to the incoming sound. The board has a 1/8" phono jacks for input that can be switched as a left or right audio input signal. An on board LED indicates when the relay circuit is activated. Timer Relay: When triggered by the sound circuit, on-board relay will turn ON for a specified period of time passing power to the connected device. Time is controlled by a simple method using "timing resistor" which are easily replaceable by the user. Time intervals can range from less than a second to about 50 minutes approximately +/- 5%. Relay has NO, Com, NC wire terminal block contacts (form C relay). Board operates from 9-12 VDC power supply. Relay and Board power can also be powered together from one supply , or different power supplies can be used for different devices connected to switching relay. On / Off power switch with LED. Servo range movement setting, min and max servo limits can be programmed. Board operates by converting the volume of an incoming sound from an audio source to a voltage signal which is sampled by a PIC microcontroller. When this voltage exceeds a certain amount, the PIC actuates a servo. The sampling rate is very fast which gives a nice servo response to the incoming audio volume. Audio input can be stereo or mono. If using stereo, there is a small slide switch that is used to select which side (right or left) you want to use. If you plug it in to a stereo source, it will only respond to one channel of the sound. This can be an advantage if you have two of these boards ­ one using each side of the stereo output. Great for applications like bantering skulls ­ just record each skull's banter on separate channels. If you want to mix both channels together, use a Stereo to Mono adapter and plug it into the audio input jack. Board operates from regulated 9 VDC @ 1 Amp power supply. Power : 9 Volt dc @ 1 Amp. Power : 5 Volt dc @ 2-5 Amp. This special board was designed to allow the recording and playback of up to 10 minutes of 4 servo outputs and 1 to 63 channels of audio MP3 playback. Audio files are stored on a SD card as high sound quality MP3 format. 1 to 63 MP3 Audio files will playback in sequence or random along with the 4 servo channels when board is triggered for playback. The Animate E2 board incorporates many features such as looping playback servo motion with variable delay between loops. On board connector for remote activation switching such as a PIR sensor, contact switch or mat pressure pad to initiate servo playback and on-board sound output. No complex programming is required. Programming is easily done, with a set of push button keys and control potentiometer built onto the board. Power Switch ON / OFF. Connection pins on-board for servos, wire terminal block fo easy hookups. Individual servo programming option for each of the 4 servo channels, along with servo travel limit options. MP3 Sound Recording time - As long-big as the SD card capacity is. Also on board is a audio controller that when the board is triggered by pressing the single on-board button or by dry contact closure at the trigger terminal, will cause the player to play back 1 to 63 MP3 files that are stored on a small SD Card and playback the recorded 4 servo channels These MP3 files can be of any size up to the capacity of the SD memory card, You can have any number of files up to 63 on the SD card. There are 2 Sound playback modes of operation provided ­ Sequential and Random. Board electronics operate from 9-12 VDC and 5 VDC power supplies for servos. 1 to 24 Volts DC power output in response to an audio signal input. Output can drive bank of LED bulbs or bars. Once recorded, each message can be replayed individually by pressing the associated button or triggered by a dry contact closure (PIR, mat, etc.) at the associated trigger terminal. The source of the sound to be recorded can be from your computer or other non-amplified (line-out) source. The recorded sound can be played back through amplified speakers. Board has input audio jack and output audio jack for easy audio hookup. ISD Sound Chip is in zero insert socket, so moving the IC Chip in a out of the socket is very easy, Flip socket lever and ISD Chip can be removed. Additional Chips available for various audio playback save and play features. (Create seasonal sound chips, or have multiple chips for various events). Audio Sample rate = 3.4kHz / 120 Sec. This board was designed to allow the recording and playback of up to 10 minutes of 4 servo routines and up to 4 minutes of audio. Audio can be recorded into 2 channels or as a single channel. Audio Channel 1 will playback with the 4 servo channels when board is triggered for playback. Audio Channel 1 and 2 can be played at any time and are independent of the 4 servo channels . Audio Input jack for direct sound into ISD sound chip and Audio output jack for connection to sound amp and speaker. Board Operates on 9 VDC. Connect this unique board to a Dynamic Microphone, an AutoTalk controller board and you have a module that will control the AutoTalk Servo movement as you talk through the microphone. Audio output Jack for connection to AutoTalk input or connection to remote powered audio amplifier. On and Off power switch with LED status light. Channel Left or Right Selection Switch on-board. Requires 9 Vdc at 0.5 Amp power supply. Board is very simple to use. Example of this board's use would be to create a talking skull that uses your own voice to communicate to others. 10 Watt Class D Stereo Audio Amplifier. Power any set of speakers. Convenient on-board volume control knob. Class D Amp, very little heat generated when board is operating. Powerful output, very reliable audio amp. Can be hidden in box or within projects. Can be easily used with the Blue Point Engineering MP3 Playback Board Series of audio playback controllers. Power your own speakers directly with this very efficient stereo power amplifier. All connections are made using screw closure terminal strips to allow for simple and direct wiring of speakers and supplying power. Volume is adjustable using the handy on-board potentiometer with turn knob to allow for precise control of volume. The audio source input is supplied simply by taking an audio patch cable and connecting the AMP Pro to a playback device such as any of the Blue Point Engineering MP3 Playback Control Boards. The AMP Pro can be powered from a variety of sources, anything from a simple plug in wall supply or even a solar panel. The power supply can range from VDC 12-20 volts or AC 12-20 voltages, giving quite a range and options which to power the AMP Pro from. Speakers, audio cables, power supply, sound playback system, switching input device not included. Small Mini Audio Amplifier Module. Stereo version has left and right 1-watt amps with independent volume control for each audio channel. 15 Watt Digital Audio Amplifier, designed around the Tripath TA-2024 IC, 15 Watt continuous average two-channel Class-T digital audio power amplifier. Class-T amplifiers offer both the audio fidelity of Class-AB amplifier and the power efficiency and cool operating of a Class-D amplifier. External Volume control. On-board audio and power connection jacks. Small PCB measures 2-11/16" x 1-5/16". Power supply: 12VDC at 2 Amp, regulated. 15 Watt continuous power applications. This Class D dual channel amplifier board employs a Tripath-style Texas Instruments TDA7492 chip. Each channel is rated at 25W, delivered with state-of-the-art sound quality. The TDA7492's efficiency eliminates the need for an external heat sink when playing music under average listening conditions. Integration of high-quality capacitors ensures hi-fi amplification output. Requires a DC power supply ranging from 14 to 19 VDC (available separately) and can be used to drive any 4 ohm or 8 ohm passive speakers. Gain control is accomplished by setting two DIP switches, and there are four gain modes available: 24.6 to 26.6 dB, 30.6 to 32.6 dB, 34.1 to 36.1 dB, and 36.6 to 38.6 dB. External volume control module required if audio level control is needed. This amazing small size, custom 75 watt output audio amplifier can be used in animatronic, haunted house applications, museum, safety info deliver or entertainment applications. Anywhere a high quality audio amplifier is needed. NOTE: Audio Amp uses 4 ohm speakers . On board power jack, and wire terminal connector with On/Off switch and power LED, wire terminal block for quick connection of power wires from Amp cable. Speaker connection board with wire terminal blocks for solder free hook-up of 4 ohm speaker set, wire terminal block for quick connection of speaker wires from Amp cable. Note: connection wires not included with optional adapter kit. The wire sets are included with the 75 Watt Audio Amp. Optional - 12 VDC Wall Power Connection Board - switch, power LED, wire terminal connectors, power jack. Treated paper cone, paper surround, and steel mesh grill. Sealed speaker back eliminates need for separate enclosure. 3-foot shielded Mono cable features an 1/8" phone plug on each end. 3-foot shielded Stereo cable features an 1/8" phone plug on each end. "Y" Audio Cable - 4"
Stereo - 1/8" to RCA "Y" Cable -12"
There are 3 modes of operation provided ­ Sequential /10Ch, Random /10Ch and Individual Channels 1-8 selection for playback. An MP3 Stereo Audio Controller, that when triggered by RF remote switch input board will cause the player to play back 1 to 8 MP3 files that are stored on a USB flash device (Micro USB flash drive included). These MP3 files can be of any size up to the capacity of the USB flash device. You can have any number of files 1 to 8 remote control or 1 to 10 audio files under sequence or random playback on the flash device. Board operates from 9 VDC @ 0.5 Amp Power Supply. Note: SanDisk USB Drive Recommended for MP3 audio files. Here is a very simple audio controller that when triggered by pressing button number one on the wireless handheld RF Transmitter, will cause the player to play back 1 to 10 MP3 files that are stored on a USB flash device (USB pen drive not included). These MP3 files can be of any size up to the capacity of the USB flash device. You can have any number of files up to 10 on the flash device. Unique setup allows USB-MP3 Module to be mounted in box, cabinet for easy access to USB and Audio Jack ports. RF Remote control channels 2-8 are available and can be assigned to other applications and / or device boards if needed. In Sequential Mode, the player will play the files back sequentially from file000.mp3 to file009.mp3 (or whatever your last file is), one file at a time each time, when triggered by pressing button number one on the RF Transmitter, After the controller has played the last file, it will go back to file000.mp3 and start over. In Random Mode, it will pick one of the files to play back at random. It will pick a new file each time, when triggered by pressing button number one on the RF Transmitter, The board controller will wait until the file has finished playing before it can be activated again by the RF hand held transmitter. Unique servo signal controlled electronic video switching system which provides clean and fast switching between 4 video channels to 1 channel. System allows 4 video channels to be switched to 1 master channel, by adjusting the R/C transmitter joystick, or assigning a servo signal value from any R/C PWM signal controller. The Video switcher board will switch one of four video input signals to a buffered video output line. The Video Switcher board is suitable for all standard CCTV type video signals. Small board approx. 2"x 4" with BNC connectors for the video and 9Vdc supply socket and servo connector. Video Switching is done by a solid state unit using a standard 4 to 1 mux under micro processor control. The processor also measure the incoming servo pulse and determine which input to connect to the video output. System is excellent for operating 4 different cameras, and sending video signal from one of the 4 cameras out to a remote transmitter. Put full 360 degree vision on your robot, airplane, animatronic character, or setup a covert operation with remote control. Adjusting the input signal (ie the pulse duration) will alter the video input being fed to the video output. The led by the side of the input socket will light when that particular input is live. Input 4 is pulse widths between 1.75 - 2.0 msecs. Micro Video Camera B/W or Color Systems. Board has adjustable potentiometer on board to set scan rate from channel 1 to channel 4. Controller automatically scan through channels sending selected camera video to video output jack. On board power jacks for powering cameras 1-4. RCA connectors for camera video signal. Unit can handle 500 gram PCB camera. The Pan and Tilt base has been designed for use with miniature pcb mounted video capture cameras and ultra-lightweight small Web Cams. Using two small standard hobby servos, it will allow the user to control the position of the camera in both the pan and tilt axes over a sector of approximately 130 degrees. The unit comes ready to plug into any R/C system or Servo Controller board. 2- Servo motors mounted in base box. Mounting plate for mini Camera. Futaba R/C servo connectors on servo wire ends. Base has flange for easy mounting to surfaces. 132 x 73mm x 30mm high. The DMX video switch board will switch up to 4 composite video inputs to a single video output. The incoming DMX data value determines which video input is routed to the output. Requires 1 channel of DMX data. The board requires a single DMX channel and is addressable in the range 1 to 512. Values 0 to 63 will switch input ch-1 to the output video 1. Values 64 to 127, input ch-2 to the output video 1. Values 128 to 191, input ch-3 to the output video 1. Values 192 to 255, input ch-4 to the output video 1. Media Recorder / Playback Module - A Item Description . Specially designed for portable video / audio and picture display, such as business presentation, advertisement, home entertainment, etc. Module - B Item Description . Specially designed for portable video/audio and picture display, such as business presentation, advertisement, home entertainment, etc. These boards were designed to allow the user to select one of four video inputs using a relay dry contact closure, manual switches or wireless RF system at one of the 4 Switch Inputs and redirect one of the 4 video channel selected to a single video output jack. Alternatively, the user can cycle through the inputs sequentially by a relay dry contact closure or by manual switch at the Video Switch Toggle Input terminal. Whichever method is used, only one input can be selected at a time. Also, there are 4 separate power output connections that can be used to power cameras or remote relays control. A red LED indicates which video input is selected. Green LED show which video channel input control has been selected. There is a Solid State relay on the board that activates as soon as a relay dry contact closure or manual switch is applied to the input terminal for the relay. A yellow LED indicates when the SS relay is activated. The difference between Video Switcher A and video Switcher B board is that 2-position terminal blocks are substituted for the 2.1 mm power connectors and the RCA jacks. Solid State Relay is rated for 2 Amps - wire terminal block for quick connection. A yellow LED indicates when the SS relay is activated. Board power needed: 9VDC at 1 Amp. 4 cameras up to a total of 1 Amp can be powered from the single power supply source connections on board. Video switch boards can be combined with optional wireless video system and remote RF hand switch system to to make a remote video monitoring system. This board were designed to allow a user the option of selecting 1-6 video inputs and several enhancements through a manual handheld control board or by remote relay dry contact closures. Using the small handheld control board or remote relay closures the use can select one of the 6 video channel and have it sent to a single video output jack, or the user can also cycle through the inputs sequentially 1-6, or select an automatic sweep, where each channel is activated for several seconds and then moves on to the next channel. The sweep speed can be adjusted by an on-board potentiometer to cycle very fast or long delays between switching video channels. Yellow and Green LED's show which video channel input control has been selected and what input is active. There is a Solid State relay on the board that is activated as soon as the board is powered on, or can be setup with a manual switch or activated by a relay dry contact closure. A Red LED indicates when the SS relay is activated. (Solid State Relay rated for 2 Amps). The files you are using may not be in a MP3 Audio format that the player can use correctly. Under a PC there actually modified MP3 files that are recorded and saved in a different format (Sample Rate) even though there MP3 files. Your files may have been saved or ripped as MP3 files but with a sample rate of (44100 and bit rate (144kbps). This sampling is a special MP3 format for higher quality playback sampling on PC's. This sample and bit rate is not a true MP3 format that the VMusic2 Module and audio playback controller board can use correctly. The True MP3 sample rate is only at 24000 for VMusic2 Module. Once you have Audicity down loaded and operating on your PC, then Open or Import the MP3 files that you have. Once the file is imported, then go and Export the file as MP3, you will see a Invalid Sample Rate dialog box come up indicating that the MP3 file is at a different sample rate then normal. The Sample Rate may be already adjusted for you (24000) or you may need to pull down the dialog box selection bar and select the sample rate of 24000. * It is recommended to format the Flash Drive as a FAT bit setup. * All Audio files must be at the root level on the Flash Drive and not inside any folders. Check your USB Flash Memory Drive to see that it has been formatted as a blank drive, before adding you new sound files, Some USB Flash Memory Drives have a security or Auto Boot feature that prevents the MP3 player from using the sound files correctly even when formatted. Re-format your USB Flash Memory Drive removing any security or Auto Boot formats first. (Format USB Flash Drive as a MS-DOS FAT) Try a different USB Flash Memory Drive type, as some manufacture brands operate different than others. 1. Start your computer and plug in the flash drive in the USB port. 2.Click on "My Computer." Click on "Manage" in the "Explorer" window of "My Computer." 2,Open the "Device Manager" and locate your USBDrive installed under the "Disk Drives" tab. Right click on "Removable Disk Drive" and click on "Properties" from the menu. 4. Click on the "Policies" tab and choose "Optimize for Performance" from the options. 5.Click on "My Computer" and choose the format on the flash drive. 6.Choose "or "FAT16" depending on the type you want from the dropdown menu box. 7. Click "OK" to complete the format. Right click on the display of the drive icon and choose the "Format to" option along with the file system type you wish to format (FAT32, FAT16 and so on). 1. Place the flash drive on the desktop. 2. Start the "Disk Utility." Click on flash drive. Use the "Erase" button. 3. Select the "MS-DOS File System" in "Volume Format." 4. Provide a new name for the drive. Click the "Erase" button. 5. Perform the instructions given on the screen and finish the formatting.